Well, apparently no one wanted to find out what a goon is or what it would be like to turn into one so, for that day, that trick actually worked and there was minimal complaining. Sunday, the five-year-old asked what day it was. So I said it was Thankful Day – like Thanksgiving day but without all the food. Yesterday, after the comparative and envious whining started up again, we decided yesterday should be “Enjoying Day” – enjoy what you have and what you get to do when you have it. But today – today is a very special day. And this time I can tell the kids I didn’t make it up – Lisa Hendey did. 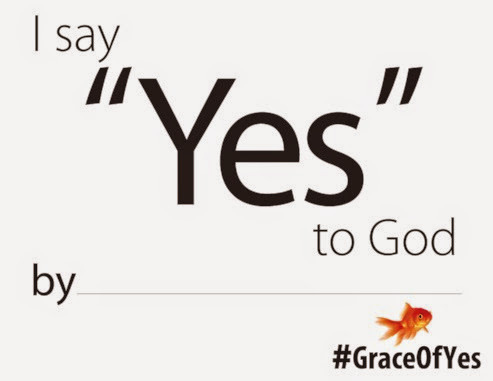 Today is YES day, The Grace of Yes Day! She said Yes? What is that? Some kind of trick to get us to do something without making it seem like she’s saying No? No, kids, it’s not trick. It’s my way of joining Lisa and hopefully the whole Internet and beyond in saying Yes to God in a very special way today. This is one of those times when it’s good to do because everyone else is doing it. 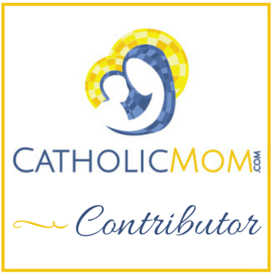 All the cool people will be instagramming, tweating, Facebooking, blogging, and G-plussing it up with their Grace of Yes Day pictures so come on and join the fun!There’s even a link-up at CatholicMom.com for you to feel like your part of the party – because you are! 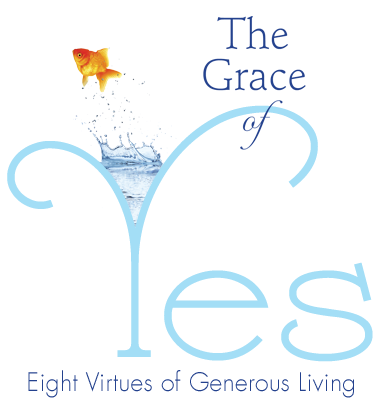 In Lisa’s newest book that just came out this month – The Grace of Yes: Eight Virtues for Generous Living – Lisa shares how freeing and fruitful saying Yes can be. It’s much easier, safer, and more convenient to say no and continue living our comfortable and secure lives. But God is always asking us and inviting us to more. He never forces or manipulates (except when he uses kids to do his begging, that’s an exception). He’s ever patient and generous in how long He waits for us. But He is incredibly persistent – always there, continuously beckoning us to come, join Him – say Yes to His Love. 3. Say Yes to offer up my day as a prayer for others today throughout the whole day – using the Rosary to keep me on track and focused. I love praying for others along with our Holy Mother – who gave the greatest Yes and gift to the world with her Fiat. 5. Say Yes to follow the Holy Spirit’s promptings and organize a Thanksgiving week service project to one of my favorite charities who says Yes to families who only see a world of No’s everywhere they turn. At CatholicMom.com today, I’m sharing 8 Ways I’m Saying Yes to God. What is God asking me to say Yes to? Go deeper – loving and giving of myself in a deeper way. To go beyond the surface, the “noise” and all the senseless chatter, past the “rules” and the “basics”, past what’s popular, and get down to the real nitty gritty – to the raw core of my faith and to the very essense of Who He IS. Live simpler – not in the secular or materialist sense, although that is part of it, but more in my every day living and faith life. He is not asking me to go out and do anything grandeous or social-media-gone-viral worthy. He wants me – plain and simple without any strings attached or showyness. He wants me to Trust – 100% unreserved TRUST. In everything. This means I need to give up worrying and really TRUST Him. That He is with me always, I can give everything to him and He will be with me. All I have to do is TRUST. That’s all. Really. I also have to trust him enough to abandon myself to Him – so He can pull me deeper and closer to Him and into His beautiful mystery. Into His Reality. Live my life here on earth as if I’m already a Saint – so I can do this work He has given me with joy, generosity, and pure humility. Looking for who I can help, who can I give love to today? Even if they don’t know they need it? Even if they never know it was me. Even if…they reject me. Even if…they aren’t thankful or “worthy”. Not in adding more things to my to-do list to check off as a fulfilled obligation. He wants me to say Yes in my willingness. In my humility. To say yes to BE NOT AFRAID to say Yes! Lisa and her publishing team, Ave Maria Press, have generously teamed up with me to offer one of her books for this give away! 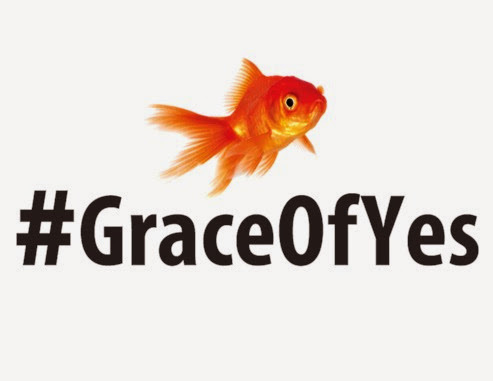 Before you enter the Give Away below, I invite each of you to join us for today’s The Grace of Yes Day! Happy Grace of Yes Day!! Thanks for coming by, Patricia! I relate to you all the way…I too am too afraid of judgement. It’s like a false humility. Thank you for this reminder. May God shower His Graces on You and strengthen you to say YES! 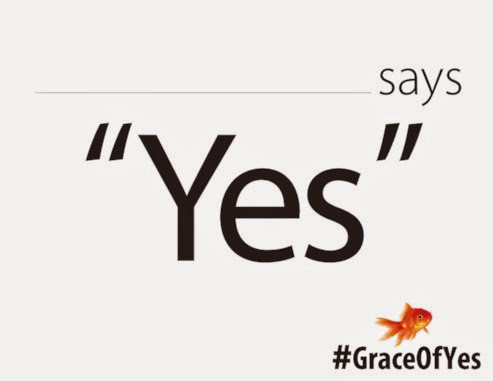 Next Post The Grace of Yes Give Away!